Chicago imagist and abstract art. As part of the mission of the A.C. Buehler Library, the librarians select and highlight collctions of books, periodicals, electronic resources, and multimedia materials on topics of interest to the Elmhurst College campus and the community. Our hope is that by facilitating access to various information resources, we can add to the rich intellectual life of our library users. - Freely view 100 years of the digitized college yearbook, The Elms (1914-2014). Other titles on the Internet Archive include An Ever-Widening Circle: The Elmhurst College Years (1995), The First 100 Years (1900), Souvenir of the Golden Jubilee, (1921), Alma Mater: a Story of College Life (1921) and Elmhurst Hymnal: and Orders of Worship for the Sunday School, Young People's Meetings and Church Services (1921). As early as 1879, the student literary organization the Meusch Society developed a reading room for Elmhurst College students in the basement of Old Main. The first official library at Elmhurst College was developed in Irion Hall in 1912. Tables from that library are still in use in the Rudolf G. Schade Archives. 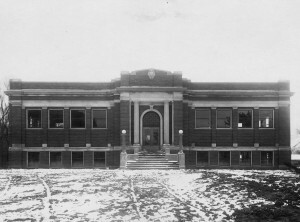 In 1921, the College constructed a free-standing library building. Memorial Library was built with funds from a campaign led by alumnus Reinhold Niebuhr sponsored by the Evangelical League. There are two large dedication plaques in Memorial Hall remembering the many German Evangelicals who served and died in World War I. Memorial Library served the college as a library from 1922 to 1971, with two wings added to the building in 1958. The building is still standing and is the home of the Deicke Center for Nursing Education. The A.C. Buehler Library was conceived after an incredible growth in the student population at Elmhurst College in the 1960s, more than doubling in just over a decade. It was built with the financial assistance of Albert C. Buehler, president and chairman of the Victor Comptometer Corporation and a member of the College’s Board of Trustees. 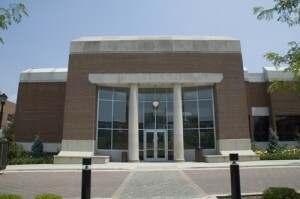 Dedicated in December 1971, the library has become a cornerstone of the east side of the campus. It has been renovated in 1993 (which involved a brief stay in Hammerschmidt Chapel) and again in 2002, due to the generous donation of the estate of Gladys (Class of 1940) and Ray Robinson. The library currently has nearly 100 computers for study and research and has a print collection of over 220,000 volumes and thousands of audio-visual materials. The library’s Rudolf G. Schade Archives and Special Collections preserve the history of the College in its nearly 140 year history. The library is also proud to be home to a collection of twentieth-century art, primarily of the Chicago imagists, and a growing collection of student pieces as well. Buehler Library Dedicated. (1971) Elmhurst College Magazine, 5(2), 10-11. This link contains library and peer performance data that has been analyzed and composed as a summative assessment. Source data for the summary can be found here as well.